Using a Chimney for a Radon Vent Pipe or My Sewer Vent? 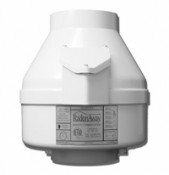 Using a Chimney or Sewer vent stack to exhaust Radon? Can I use my chimney for a radon vent pipe? Well you can if the chimney is no longer in use, but it will have to be lined with a PVC pipe. Metal and masonry flues are not adequately sealed for extracting a cancer causing gas such as radon. PVC piping is also better able to handle the extremely moist conditions that develop because of condensation produced from the damp conditions found in the soil below most buildings. If your old flue is still protruding above your roof you have another problem to deal with. Since the radon fan can't be located in the basement, the only other location will be on top of the pipe above the roof. Not a very attractive location and will also present some issues with the electrical hook-up. One alternative would be to enter the attic with the PVC pipe and exit out the roof elsewhere. Thus the fan could be installed in the attic. Or we have dismantled chimneys in the attic, repaired the roof deck and still run the pipe straight out the same area. This can be a lot of work! Can I just tap into my sewer vent pipe? 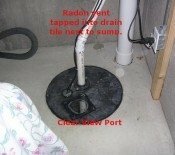 Using a sewer vent for your radon vent could be explosive and smelly. If the fan was not operating sewer gasses could fall down the radon vent and settle under the house. This is a serious plumbing code violation and safety issue.